This week, we are focusing our attention on preparing our 72 hour kits for an emergency evacuation. The faster a person can leave their home solely depends on how prepared they are, and if an initial plan was set. 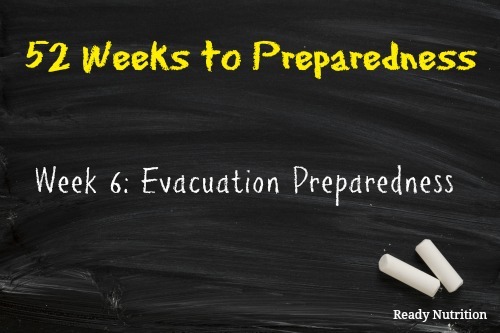 This week, we will concentrate on the evacuation aspect of preparedness. Many who have first hand accounts of mass evacuations from Hurricane Katrina and Hurricane Rita will tell you that it is not fun. When we think of evacuations, we typically think of the mass exodus we witnessed on television with the aforementioned storms. Depending on the area you live in, there are times when evacuations are more localized and require you to leave your community or town. Being that I live in Houston, I not only have to worry about hurricane season, but I also have to worry about chemical leaks from the refineries in this area. If a refinery emergency were to occur, I would have to leave immediately, thus giving my family only a few minutes to evacuate our home. Having a pre-assembled bag with basic survival needs in place will expedite the evacuation process, as well as keep things running smoothly. The main goal of having a 72-hour bag is to be equipped to survive for three days. Therefore, keep your basic survival needs in mind: food, water, shelter, clothing, sanitation, medications/prescriptions. In addition, I would also pack some extra emergency money or a credit card with enough money for gas and lodging in case you run into a monetary issue. Click here to get more details on preparing a 72 hour bag. Preparing a bag for evacuations takes more time than one would think. Taking survival needs into account is one thing, but trying to collect prescriptions, children’s special items, and personal documents can be frustrating if you were under time constraints. Preparing ahead of time for evacuations will cut down on the headaches, and keep you one step ahead. Water containers for each family member. Alternatively, you can purchase water containers with filtration devices inside them. Don’t forget to pack items for pet needs. In additions, some other items to include in your evacuation packs are a first aid kit, hygiene items (toilet paper, deodorant, feminine products, shampoo/soap), and personal documents. As well, pack a get home bag and store it at the office or in your vehicle in case you are stranded. 1. Create an evacuation plan including an emergency meeting area for family members, multiple evacuation routes, a list of emergency phone numbers. Having this checklist on hand will keep an evacuation as organized as possible. 3. Place packs near an emergency exit or in an easy to access area. 4. As a family, discuss the evacuation plan, and include a discussion on the protocol and emergency exits. Google worthless chinese fire starters.